"Put the tea-things in boiling water, after bearing flushing with heating water, then put in proper amount of tea leaves. 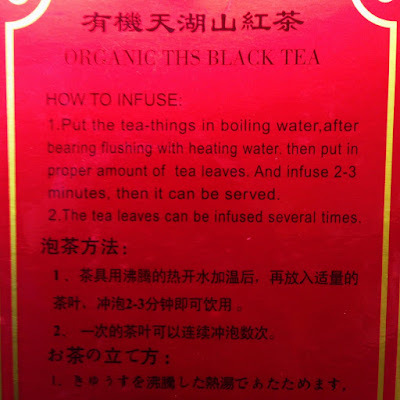 And infuse 2-3 minutes, then it can be served." At a quick glance I thought this was rinsing the tea, but then realized it was the 'tea-things', which I assume means the brewing vessel and cups. The first step in brewing gongfu style is to rise the teapot and cups in hot water to warm and clean them. I assume this is what was mentioned, but the other packages of tea from the same brand didn't have this same instruction. I was also surprised by the 2-3 minute steeping. I haven't encountered such a long steep time for an initial gongfu style preparation. The English directions don't specify how much tea to use, or what sort of vessel to steep in. So it's possible it could be for a larger teapot. Nevertheless, the curious directions helped me realize I don't often heat my vessel or cups before brewing. I know this is an important part of the tea-making process, and I'm glad to have the reminder. In serving tea in the proper British way, the porcelain teapot is also warmed before adding the leaves. Again, it helps the pot retain the heat. When I'm at home using a large teapot, I usually forget to pre-warm the pot, of course. I can't say if the tea tastes better with a warm pot. Do you think it does? Since I'm not a big fan of extremely hot tea, I don't mind if mine cools a little bit faster that it should. 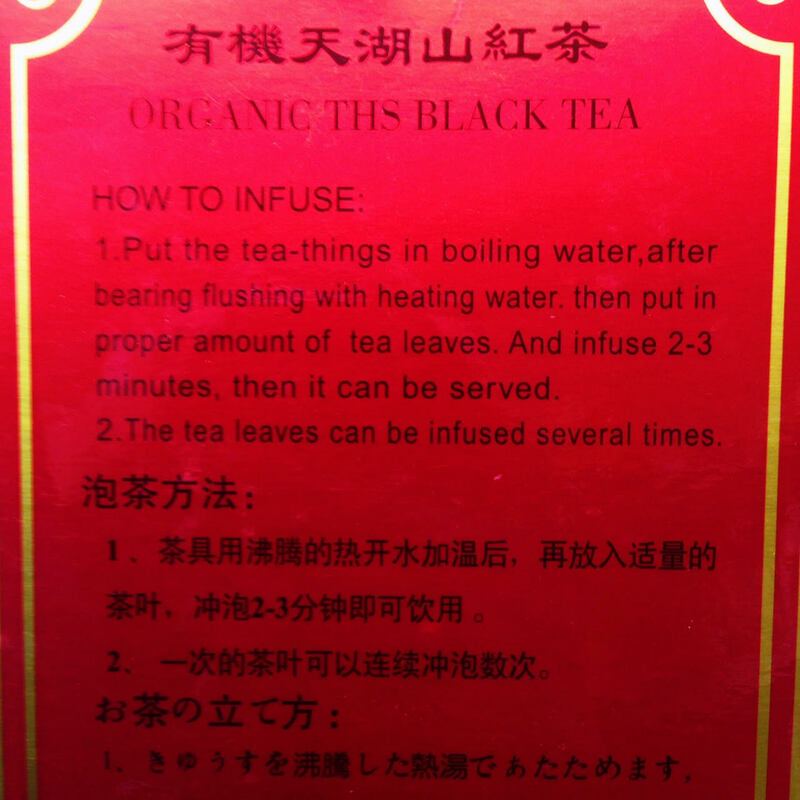 In fact, when I prepare black tea with boiling water, I have to wait at least 5-7 minutes before I take a sip. I like my tea just the other side of 'hot'. Even if I don't follow the rinsing instructions, they are a reminder to pay attention to the tea, and take in the whole process. Thinking about each step certainly helps me stay in the moment, and pay proper respect to the beautiful leaves (even if I skip a step). Also, I like calling the teaware 'tea-things'. For whatever reason, I keep imagining golem clutching a yixing teapot says 'my precioussss tea-thingssss'. Well, that's what they are, after all. Lately I have been warming my gaiwan before adding tea leaves in part to rinse/clean it from prior use. I also rinse the leaves before the first infusion but I add just enough water to cover them and only steep for 5 seconds so it's not much liquor to discard. I use the rinse to warm my serving vessel and/or tea cup. Those instructions are quite curious. Sara, thanks for this thoughtful post! It's such a great reminder to try to be mindful. I do sometimes drink the initial steeping and think it's a great way to notice the difference among steepings--it's ultimately a matter of taste. I like to try everything myself--the good, bad and the ugly, as one of my tea teachers says. I find it useful in learning about different teas and brewing methods. 2-3 minutes sounds like it could be a lot for the gongfu method. But for what it's worth, I also think it really depends on the specific tea, how dense it is and how much you use, everything. There's so much variation. I learned this recently trying to make a one-page brewing guide for an event and ended up weighing tons of teas. Makes life and tea fun.